in 360i News, Creative & Tech with tags gaming, Subway, sxsw, technology Both comments and trackbacks are closed. 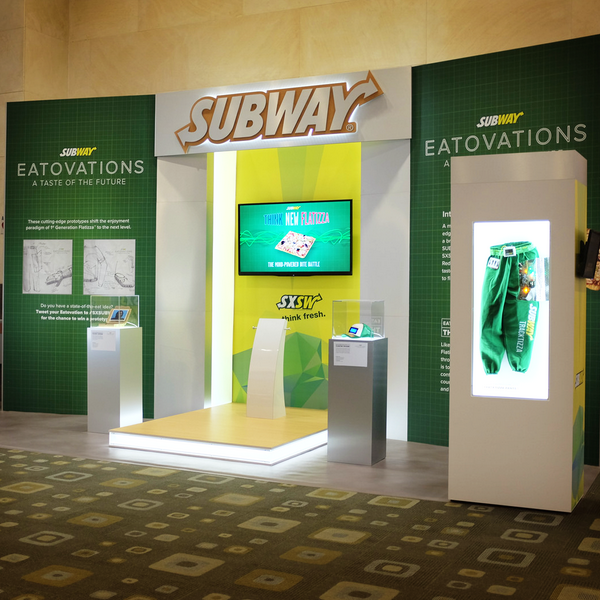 SUBWAY Restaurants, a headline sponsor of SXSW 2014, is letting fans in Austin get a taste of its newest “eatovation” via an interactive game called “Think Flatizza.” Flatizza™ is a brand new product from SUBWAY that combines fresh-baked flatbread with marinara sauce, mozzarella cheese and toppings added to your liking. To introduce Flatizza to the masses, Jared Fogle – “The SUBWAY Guy” himself – will be at SXSW helping fans get a bite of the newest, edgiest, crispiest and cheesiest menu offering. With him in Austin will be a one-of-a-kind interactive experience, dubbed “Think Flatizza,” which harnesses the power of the mind via electroencephalography (EEG) technology. Here’s how it works: While wearing EEG-reading headsets (which measure brain activity), players will be asked to focus on images of the SUBWAY Flatizza on a monitor. By concentrating on the Flatizza, players will enter a virtual game of tug-of-war which they’ll be able to win with happy Flatizza thoughts. Conference goers can test out the experience from Friday, March 7 to Saturday, March 15 in the Austin Convention Center. In addition to “Think Flatizza,” SUBWAY will be feeding creativity at the official #SXSUBWAY SQUARE (4th Street and Red River) through March 15. There, fans can, visit a dedicated Flatizza food truck and enjoy some music at the Grooveshark DJ Booth (March 11-15 only). Tumblr Neighbors Meetup (March 9): SUBWAY will host a Tumblr Meetup and Q&A with the cast of the upcoming film Neighbors, including Seth Rogen and Zac Efron at the SXSUBWAY SQUARE. Jimmy Kimmel Live (March 11): Flatizza makes its small-screen debut via a live commercial aired during the SXSW edition of Jimmy Kimmel Live. Grooveshark Flat Tracks Radio & Concert (March 11-15): Throughout the conference, tune into SUBWAY-branded radio for great music and SUBWAY happenings in Austin. The Flat Tracks radio broadcast will also be featured on Grooveshark’s homepage. In addition, SUBWAY will be providing Flatizza and giveaways at the Grooveshark concert on March 14. Social Scavenger Hunt (March 9, 11 & 14): SUBWAY will be giving away tickets to all of these events via a social scavenger hunt on Twitter. SUBWAY is a client of 360i. Follow the brand on Twitter all week long via #SXSUBWAY.